Founded in 1965 in an outbuilding of the family's typewriter business, the Alpina tuning concern made rapid growth and has been a manufacturer of its own BMW-based cars since 1983, as well as BMW's chosen performance partner for the last 40-plus years. Far from being direct competitors to BMW's own 'M' range, the Alpina products focus on engines of optimum torque, interiors of supreme luxury and a very high level of overall refinement and style. They therefore appeal to a slightly different clientele. The Alpina club is also a highly exclusive one. Every example has an internal plaque inscribed with its unique build number and fewer than 2,000 vehicles are sold by the company each year. 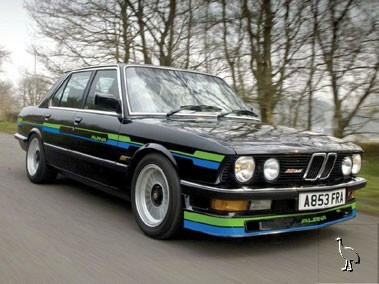 The Alpina B9 saloon was based on BMW's E28 5-Series model. The 64 righthand drive cars made were built by UK dealer Sytner, The engines were increased in capacity to 3430/3453cc and featured gas-flowed cylinder heads with hemispherical combustion chambers, high-lift camshafts, balanced pistons, reprogrammed engine management systems and twin-pipe sports exhausts. The suspension comprised progressive rate springs combined with Bilstein gas dampers. The car's tendency towards tail happiness was checked by a limited slip differential and wider section wheel/tyre package for the rear. The aerodynamic aids (developed in BMW's own wind tunnel) comprised a deep chin spoiler and boot-mounted rear wing. The 245bhp B9 could accelerate to 60mph in 6.8 seconds. The black B9 with Getrag 5-speed manual gearbox on sale carries plaque number 307 and was the subject of an enthusiastic six-page feature in BMW Car last year. Though the car was reputedly tidy when purchased by the current owner, he had the coachwork renovated, followed by a full respray; the results of which clearly impressed the magazine. They did, however, note that neither the exhaust nor boot spoiler were standard. The car is MOT'd into February next year and is described by the vendor as being in "very good" condition with regard to its engine, gearbox, electrical equipment, interior trim, bodywork and paintwork. According to the magazine feature, 'it is now so nice that he will not take it out in the rain' - hence the sale.